How Much Would You Spend on a Candle? This past weekend, I stayed with a friend. She put me in her guest suite (so fancy!) and had this lovely hand soap in the bathroom: it smelled like rum. Ooh, bergamot and vanilla? Sign me up! My friend, of course, had picked up the soap on a work trip, where it was a gift. I found it on the internet, and noticed that they have a scented candle version, too. So you’d think I’d have no problem shelling out for a candle, right? But I balked: the site is in the United States, so the candle would work out, before shipping, to be $70. (Darn exchange rate!) And that’s if I could get it shipped to Canada. In Canada? 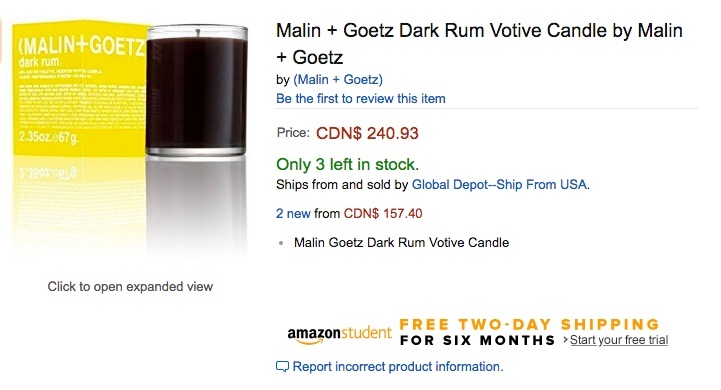 I checked – on Canadian Amazon, the same candle is…. (drumroll) $241! And not for one of those giant candles, either – for under 100g of candle. Amazon is definitely out. Instead, I have liked Malin + Goetz on Facebook, and am going to wait for a coupon code. Then I will stock up! And not just on the candle, but probably the body wash too.